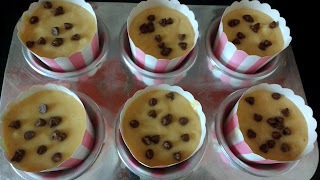 Eggless Orange Chocolate chips muffins are delicious zesty muffins made using orange juice and melt-in-mouth chocolate chips. The oranges are tangy and fresh in flavour whereas chocolates fill your palate with warm creamy sweetness. Together these make perfect combination for any dessert. I am a big time fruit lover. I can never say NO to any fruits. Till now, I have shared the recipe for different fruit muffin/cakes like Apple Cinnamon Muffin, Banana Oats muffin, Mango Cake. This time I am going to share Eggless Orange Chocolate Chips Muffins' recipe. These muffins are topped with glossy orange marmalade glaze which can be made in just one minute and enhances the taste many folds. 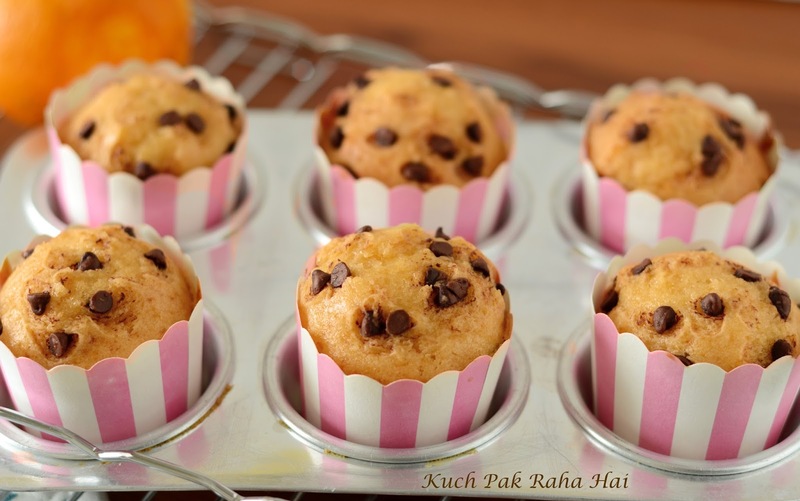 The muffins come out so soft, spongy and bursting with flavours of fresh orange. The recipe is quite simple and does not need many ingredients. Kids would especially love it because of its flavour. 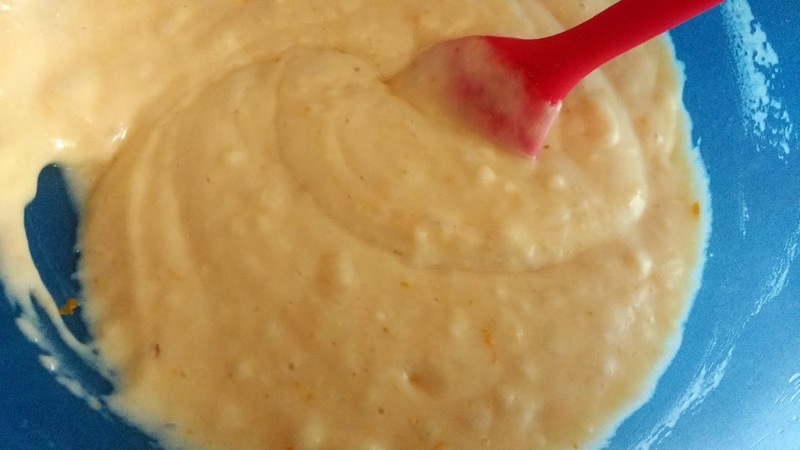 Orange juice has been used in this recipe. You can use fresh or packed orange juice as per your convenience. If you are using packed orange juice with high sugar content, please reduce the amount of sugar. I have not added any artificial colour or essence in this preparation. You can use them if you want to. Hope you would like this delicious Eggless Orange Muffins recipe. I have not used any artificial essence or food colour in this recipe. 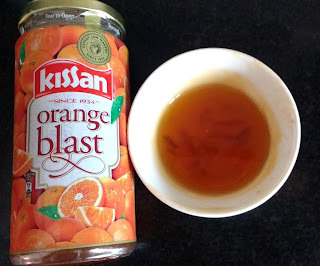 If you want the orange colour or aroma to be more intense you can add them. 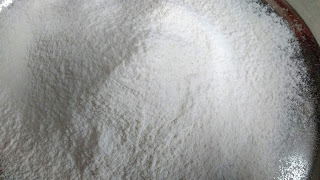 Sieve together Maida, baking powder and baking soda. These are the dry ingredients of the recipe. Keep them aside. Take a mixing bowl. 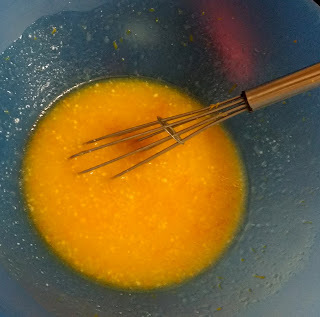 Add orange juice to it and sugar. 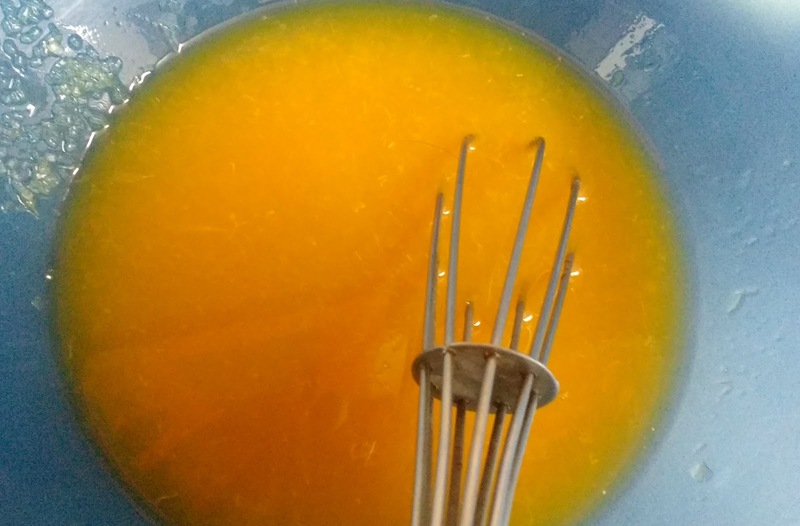 Whisk together both orange juice and sugar till sugar is completely dissolved in it. Set the oven for preheating at 180 degrees Celsius. In the meantime lets proceed to next step. 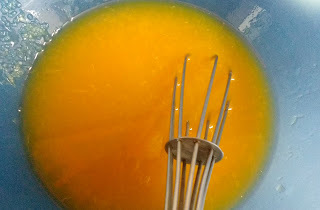 Add curd, orange zest and oil to the whisked orange juice & sugar. Whisk together once again to form a even mixture. Add the dry ingredients which we kept aside in step1 to this liquid mixture. Fold it gently to form a uniform batter. If the batter seems to be thin add 1 or 2 tbsp of maida/all purpose flour to it. 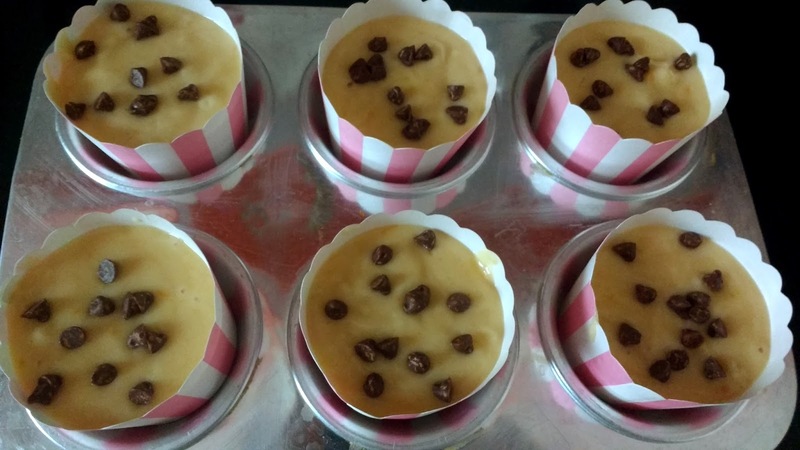 I generally use silicon spatula for folding the cake/muffin as it is really gentle and also helps in transferring the batter in moulds/liners without creating a mess. For checking out the product specifications, you can click the link here. Spray the muffin tin with some oil or use paper liners. Transfer the muffin batter into the liners using a spoon & spatula. Please make sure you fill the liners only 2/3rd. Leaving this much space is necessary for muffins to rise else they would overflow. Sprinkle some chocolate chips over the top. If the oven has preheated by now, keep the baking tray inside it. Bake the muffins at 180 degrees for 25-30 minutes. After 25 minutes, prick the centre of muffin with a toothpick. If the end of tooth pick comes out clean, the muffins are ready else bake them for 5 minutes more. Take orange marmalade or glaze in a microwave safe bowl. Add water to it. Microwave it for 30-40 seconds. It should turn smooth and flowy just like a sauce. As you can see below, I have used Kissan Orange Blast marmalade. 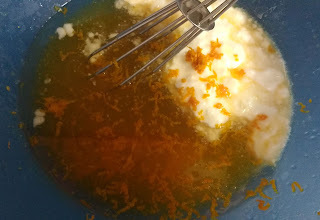 I prefer it for making glaze as it consist of some fresh orange zests and really smells & tastes nice. Brush these on top of the muffins. Do this when the glaze is still warm. Once cooled, this glaze will set over the muffins just like gel. 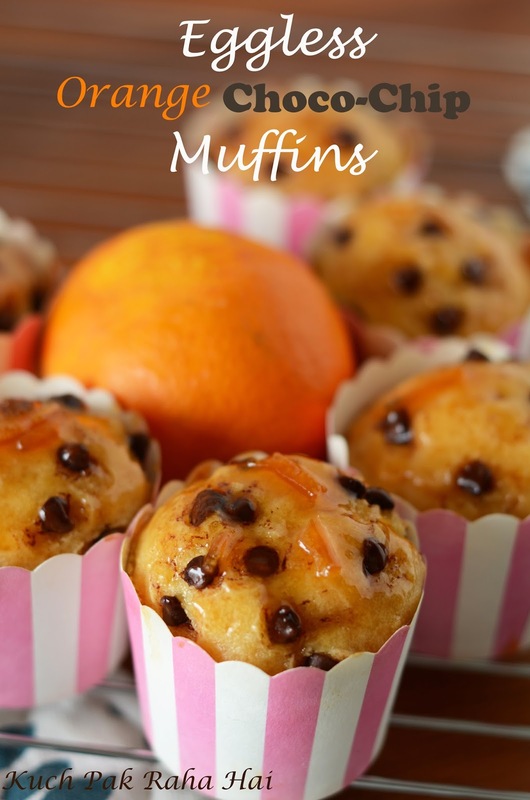 Enjoy these delicious sweet & tangy Orange chocolate chip muffins!! !